By now you should have received revised rates reflecting the rate increase effective September 1, 2017. All Systems Go Transport (ASGT) is pleased to have been able to maintain the previous rates for 3.5 years. 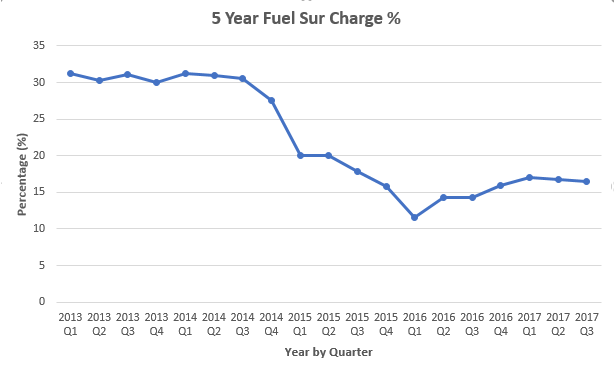 This combined with the continued reduction in fuel cost reflected on the line graph below, has afforded all of us a nice reprieve from the rising costs that other industries have endured. We hope you understand the necessity to ensure coverage of your orders, to continue providing you with the highest level of customer service, and to remain competitive in the current environment. If you have not received revised rates on any existing 2017 lanes or require additional rate quotes, please contact us immediately. Jennifer and I appreciate your continued support and business and look forward to serving your trucking needs.